The functional reliability of the tower and the foundation is the premise upon which safe operation of the turbine is based. 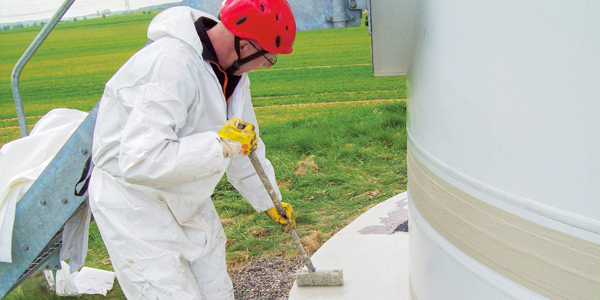 Since the risk of damage, cracks, spalling and corrosion increases as the turbine ages, the stability of both components needs to be regularly inspected. On request, the foundation is systematically monitored and documented, also within the scope of a full maintenance contract. It is not uncommon for towers and foundations to show signs of damage from corrosion. If this affects the flange connections or the reinforcement, this may endanger the operation and static stability of the wind turbine. Our restoration solution for towers and foundations offers permanent protection from corrosion as it prevents the ingress of water. We use the highly elastic sealing system, Concrete Power Seal (CPS or PPS Protect Power Seal for high concrete foundations): The system, which is made of liquid plastic materials based on polymethylmethacrylate (PMMA) resins, is so flexible it can even offer reliable protection at extreme locations (onshore and offshore). We inspect the subsurface of the foundation base with an ultrasonic device, which also makes it possible for us to chart cracks in the concrete. It is a tried-and-tested method to determine concealed damage to the subsurface, which can lead to detachment of the layers of concrete. After precisely analysing the charted cracks, we then initiate the corresponding measures for maintenance and repairs or refurbishment. With a lifespan of 20 years, a turbine will generate approximately one billion load cycles – that represents an enormous load for the foundations. When cracks occur we prevent any further ingress of water by applying our sealing system. This procedure has proved its worth even in extreme locations such as offshore, for example. In accordance with the maintenance guidelines laid down by the DAfStb (German commission for reinforced concrete), our service technicians have been certified in the areas of protection, maintenance, setting and reinforcing of concrete structures by the BZB Academy. If the flange connections at the edges of the tower segments are not precisely aligned, water may penetrate into the tower. The consequence of this is corrosion. We professionally eliminate this damage to the tower segments and the welded seams as well any soiling on the towers. The flange connections are then permanently sealed using our nonwoven fabric-reinforced sealing system, CPS. Highly elastic systems made of liquid plastic materials based on PMMA resins have proved their worth for sealing towers and foundations. We use Concrete Power Seal (CPS) for the horizontal surfaces of concrete foundations (full-surface nonwoven fabric-reinforced). On vertical surfaces of high concrete foundations we apply Protect Power Seal (PPS) (without nonwoven fabric). CPS is also suitable for use at locations subject to extreme conditions as the system has proved to be very flexible at temperatures of plus 80° Celsius to minus 20° Celsius and therefore also for offshore applications. The CPS system has been designed for a minimum lifespan of 25 years and has European Technical Approval (ETA-08/0265 of the Deutsches Institut für Bautechnik, the German institute for construction technology). Recording climate data such as ambient temperature, surface temperature of the concrete, humidity, residual humidity of the concrete and testing of the adhesive tensile strength. Coating: priming, isolation between joints and coating, permanently elastic sealant using a highly tear-resistant, embedded nonwoven fabric, optionally a further resin layer with high-silica sand for slip resistance in accordance with DIN (German institute for standardisation)/ final sealing. Concrete foundations are subject to an enormous load offshore: the chloride in the sea air, extreme weather conditions as well significantly higher wind speeds all expose the joints between the steel tower and the foundations to many times the load of onshore shoreline systems. CPS has been specially developed for use in extreme locations. Safety aspects are accorded the highest priority when carrying out every part of our task. Before employees are appointed to the offshore area, our technicians attend Basic Safety Offshore Induction and Emergency Training (BOSIET) as a matter of course.